363 pages | 33 B/W Illus. New technologies, including DNA and digital databases that can compare known and questioned exemplars, have transformed forensic science and greatly impacted the investigative process. They have also made the work more complicated. Obtaining proper resources to provide quality and timely forensic services is frequently a challenge for forensic managers, who are often promoted from casework duties and must now learn a whole new set of leadership skills. The interdisciplinary and scientific nature of laboratories requires strong leadership ability to manage complex issues, often in adversarial settings. 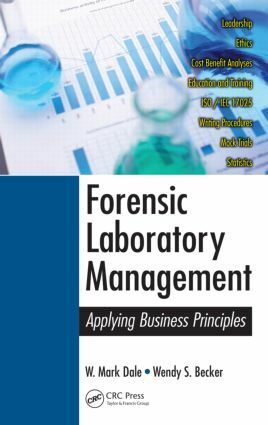 Forensic Laboratory Management: Applying Business Principles provides laboratory managers with business tools that apply the best science to the best evidence in a manner that increases the efficiency and effectiveness of their management decision making. The authors present a performance model with seven recommendations to implement, illustrating how forensic managers can serve as leaders and strategically improve the operation and management in scientific laboratories. The book includes case studies simulating a working laboratory in which readers can apply business tools with actual data reinforcing discussion concepts. Each chapter also includes a brief review of current literature of the best management theories and practice. A supplemental DVD supplies two mock trial transcripts and associated case files along with PowerPoint® slides from Dr. George Carmody’s workshop on Forensic DNA Statistics and Dr. Doug Lucas’s presentation on ethics. "Dale’s diverse and extensive forensic laboratory, forensic education, and forensic laboratory quality assurance experience provides excellent insight. …comprehensively covers laboratory management issues in the American crime lab. I intend to use it as a required text in my class. The book touches on nearly all of the aspects that I cover in the class, and does so in a clear and organized fashion." Why Is Ethical Conduct Important to Forensic Laboratory Management and Staff? Codes of Ethics: What Are They? Who Needs Them? W. Mark Daleis co-principal of Becker–Dale Consulting and most recently the former program manager for Forensic Education and Training at the U.S. Army Criminal Investigation Laboratory (USACIL). Previously, Dale was the director of the Northeast Regional Forensics Institute (NERFI) at the University at Albany, State University of New York, providing education primarily in forensics biology. Before his position at NERFI, he was the director (inspector in charge) of the New York State Police Laboratory System, Washington State Laboratory System, and the New York City Police Department Laboratory. Dale has also been the president of the American Society of Crime Laboratory Directors (emeritus member), chairman of the New York State Crime Laboratory Advisory Committee, and member of the New York State Commission on Forensic Science. Dale is also an ASCLD/LAB Legacy and International ISO/IEC 17025 trained auditor, ASQ Green Belt Six Sigma certified, and has participated in many ASCLD/LAB Legacy inspections. Dale has coauthored several forensic science management publications with Dr. Wendy Becker. Wendy S. Beckeris assistant to the associate provost and graduate dean and professor of management at Shippensburg University. She teaches in undergraduate, master’s, Ph.D., and executive programs in the United States, Austria, Portugal, Spain, and the United Kingdom. Becker received the 2011 Research Excellence Award from the Academy of Human Resource Development. Her research appears in Organizational Research Methods, Academy of Management Learning and Education, Organizational Dynamics, People and Strategy, Research in Organizational Behavior, Human Resource Development Review, Organization Management Journal, Team Performance Management, and Personnel Psychology, among others. Becker earned her Ph.D. in industrial-organizational psychology from Pennsylvania State University. Previously, she was editor of the Industrial-Organizational Psychologist.